One of the completely ignored aspect of iPhone 6 so far have been its battery in the ‘leakomania’ of interwebs. While the leaks have majorly focused on the design aspects of iPhone 6, we also have seen some component images especially a few power and volume cables and more recently, the tweaked Touch ID leaked image. However, in a welcoming change of events, today we are seeing a much needed iPhone 6 batter leaked image. This alleged iPhone 6 battery image shows an improved battery which has at least 16% larger capacity than the current flagship iPhone 5s. As the September nears, we have started to see an increasing amount of images focusing on the components of the flagship smartphone. This latest comes from the regular French website Nowhereelse which has shared an image of the internal battery used in iPhone 6. It appears that the iPhone 6 battery will have a slightly larger 1,810 mAh capacity which is quite a good improvement over the current iPhone 5s and iPhone 5c battery coming at 1,570 mAh. This actually confirms the earlier rumors that had revealed that the next gen iPhone will have a battery between 1,800 and 1,900 mAh. 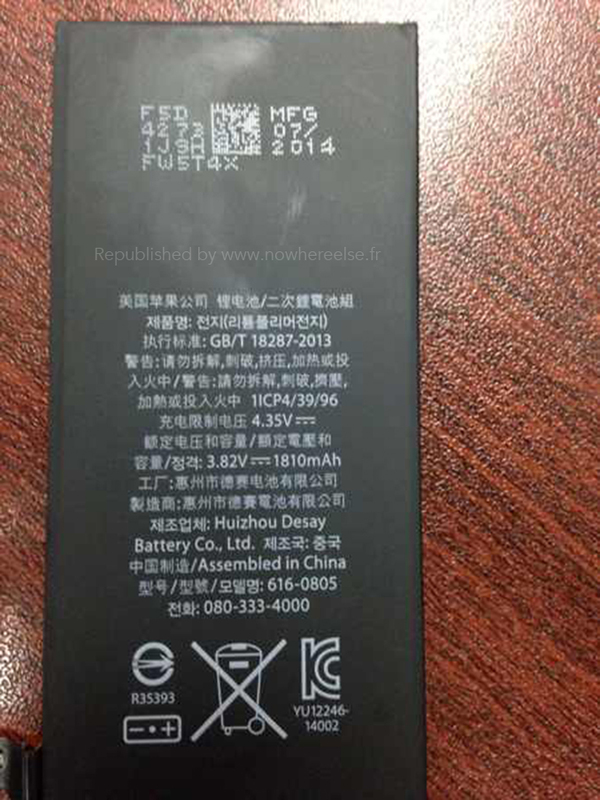 This alleged iPhone 6 battery image might actually be a correct hit considering Apple would need to fit in a larger battery in the larger displays expected of this year’s release. While improved, the 1,810 mAh capacity battery of iPhone 6 is actually smaller than the other flagship smartphones like the HTC One M8 and the Samsung Galaxy S5. However, the increased focus on power optimization through software tools can help Apple gain a good standby time. Apple’s next-gen iPhone is expected to be launched in two variants of larger display sizes: a 4.7-inch iPhone 6 and another 5.5-inch iPhone 6 sapphire display phone. While the former too is expected to be made with sapphire, some reports suggested that Apple might not introduce both the smartphones with scratch-resistant, expensive glass. Leaks have also indicated that the bigger, 5.5-inch phone will be announced later in the year with more premium specs hitting the Android phablet market dominated by LG G3 and Samsung Galaxy Note. iPhone 6 will have a focus on fitness apps powered by iOS 8; an A8 processor, a better camera and a curved design that has been shared by various rear shell panel images of the smartphone.